is a vegetable stew or chowder based on a broth made with tamarind and pigeon peas, and is very popular in the southern regions of India especially in Tamil Nadu, Kerala, Karnataka and Andhra Pradesh. 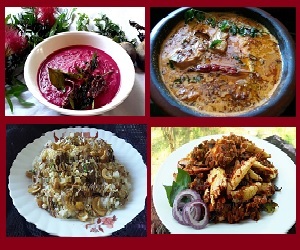 Each state in South India prepares it with a typical variation, adapted to its taste and environment. 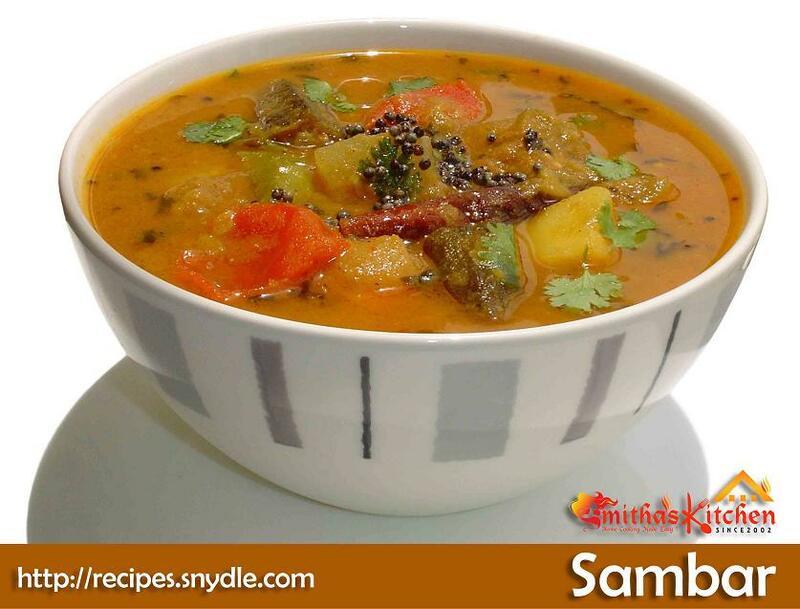 Sambar accompanies many South Indian meals, like dosa, idli, vada, rice. Soak toor dal for 30 minutes in normal water, drain and pressure cook with just enough water, salt and a pinch of turmeric powder. Meanwhile heat 1 tablespoon of oil in a fry pan, sauté the sliced ladyfinger for a couple of minutes and keep aside. Saute the shallots into the same oil for a couple of minutes and transfer it to the cooked toor dal in the pressure cooker. Then add diced vegetables and turmeric powder, green chilli, salt to the cooked toor dal and cook. When the vegetables get cook, add tomato. Dissolve the tamarind pulp in ½ cup of warm water and add it using a strainer. Add sambar powder, mix well and continue cooking on medium low flame for a couple of minutes. Add asafetida and chopped coriander leaves. Heat oil in a small pan and splutter mustard seeds. Add dry red chilies, curry leaves and season it over the sambar.